Home / Blog / HowTos / How Much Does It Cost to Hire a C++ Developer in Ukraine? How Much Does It Cost to Hire a C++ Developer in Ukraine? ‘C’-languages have been continuously used for lots of years to create computer systems and applications. C++ developers can work in the financial industry, gaming, banking, telecommunications, electronics, manufacturing, retail, and many other fields because C++ is one of the most popular programming languages. Sometimes employers hire C++ programmers on leading positions like Software Engineering Director or Software Architect because they can not only code. Senior C++ coders often work as a part of big development teams writing algorithms or overseeing the development process. It would be nice to mention, that the level of interest in this type of developers almost haven’t changed since 2011 according to Google Trends, which means, the demand stays still. In this article, we will take a closer look at what applications can be created with the use of C/C++ language, how to hire C developer with solid knowledge and experience in the field, and what projects an experienced C++ developer can contribute to. The C programming language was presented by Dennis Ritchie from a R&D company Bell Labs not long ago, in 1972. It was called C language because there was B language previously presented by Ken Thompson of the same development company in 1969. Being not tied to any exact hardware of system, C technology made it easier for users to create programs that can run on different types of machines without problems or without significant changes. As C language was created and tested by programmers based on wishes of programmers, the technology met requirement of the developers of those times great. Initially, the language was created to allow programmers design UNIX operating system that then, was used for many years on many computers and brought a start for well-known macOS and Linux OS. So, C language was useful to its maximum from the very beginning. But what is more, C language is still being used nowadays and stays at the 10 most popular programming languages in the world. Usually, C is defined as a middle-level language because it consists of the functionality of the previously used low-level Assembly language with a combination of high-level language elements. It allows the technology to provide developers with control at any stage of program operating and to offer a direct access to the mechanics of the operated hardware. Naturally, such powerful and easier-to-use programming language has quickly spread beyond the research center territory. Within a decade, the C language replaced previously known PL/I and Assembly language and programmers switched to coding in C. But what is more, different companies started working with slightly different versions of C, making it difficult for developers from different organizations to understand each other and come up with a compromise programming solution in case of cooperation. Therefore, American National Standards Institute (ANSI) made efforts to standardize C definition and an approved version called ANSI C was presented in 1989 and approved by ISO in 1990. After that, every compiler had to be able to adhere to this standard and the miscommunication problem in the development community was solved. Do Developers Still Use C Language? Probably, at that time, no one could expect that C technology will live through that many years and will be still successfully used by millions of developers around the world. But the facts prove that each year, the C programming language is highly ranked among other programming languages even on such reputable sources as RedMonk and TIOBE. No wonder, that the number of repositories related to C technology has almost reacher 300,000. It proves that through many years, the truly universal C language is still in high demand. One of the biggest advantages of C technology is its constant evolution. The latest standard C11 adopted in 2011 provides multi-threading and advanced Unicode support, allows the programmer to create a sager code with bounds checking functions, and other useful features. Among C compilers that support the latest version are C Compiler for Windows 32/64, Clang, Pelles C, Intel C 16.0, etc. C proved to be the programming language with the biggest software ecosystem and a handy tool for many developers. Linux OS. When it comes to saying what is C programming used for, many programmers mention Linux system. It is because this operating system is almost written in C language. As most powerful supercomputers use Linux kernel, not taking into account personal desktops, it is worth saying that C is a powerful tool capable of such complex projects. Microsoft Windows OS.Windows kernel is mostly written in C as well, though some parts were made in Assembly. Windows OS is known as the most used operating system covering almost 90 percent of individual market share, so this is another strong example of C capability and up-to-date capacities. macOS. No wonder, that macOS, previously known as Mac OS X, is also partly written in C language. Every program working on a Mac computer is running on a C-written kernel. 3D Movies. Another remarkable application of C language is 3D images and films. Such animations should be very fast-processing and detailed, thus, programmers relate to C language when it comes to processing a big amount of data and calculations per second. Mobile Devices. Mobile app development is growing tremendously, and such mobile platforms as iOS, Android, and Windows phone have C-developed kernels as well, basically being portable adaptations of OS’s kernels. It allows mobile devices to be highly efficient in operating a huge amount of information as most people tend to consume information and use a number of computer functions on the go. Databases. Databases take a big part of our lives and used in all spheres of daily life. And it is the C language that made a base for Oracle, MySQL, and MS SQL Server that are the well-known databases used in financial, education, health, retail sectors, etc. It is true that nowadays, there are many programming languages to satisfy any programmer needs. Surely, they can be even more efficient for some types of projects comparing to C technology. But there are plenty of solid reasons that we will mention further why C programming is still widely used by programmers around the globe that still believe in C technology as a strong basis for any project. Knowing C is a strong base for learning higher-level languages such as C++, C#, Objective-C, Python, PHP, Java Programming that all have block syntax used in C. But what is more, the C technology itself is still used for a numerous software including Apache and NGINX Web servers, SQLite, GIMP, Perl 4, MATLAB, most device drivers, and applications available on the web. Although most browsers are written in C++, C code is used as basis and infrastructure, supplying sending and DNS utilities. Talking about samples of applications that may be created with C, take a look at this useful source. There you can find some C programming examples by categories (Basic Input and Output programs, Looping (for, while, do while) programs, User Define function programs, file handling programs, common C program errors, etc. ), C standard library functions, and advance C programs as well. For example, here is a C program for Gross Salary calculation. Is It Worthy to Hire C Developers from Ukraine? Ukrainian developers proved to be one of the most skilled after being hired at IBM, HP, Intel, Google, etc. Well-established payment systems through PayPal, Payoneer, Skrill, etc. Most of the employees are looking for a full-time job in the office, but at the same time, almost every expert is willing to work as a remote C developer as well. Also, if you considering to put the whole development process on outsourcing, you can find a reliable Ukrainian development company with a dedicated team of C developers working in the Ukrainian office for your project. Ukrainian C developer salary range significantly differs from the rates of programmers from the US and Western Europe, so it will be beneficial to find the right person from Ukraine to work on you. Now, let’s take a look at C++ language, its features and specialties comparing to C. Is it better to hire a C++ programmer instead of an experienced C coder? Initially, C++ language was developed as an extended version of C and, thus, has a name that consists of C and additional features added. C++ was created by a Ph.D. student Bjarne Stroustrup from Denmark who was eager to make an advanced object-oriented version of C technology without any decreases in processing speed or productivity. It worked, and since the information about C++ was published in 1985, for all these years C++ became a widespread programming language used alongside C for any types of software development. It is significant to note that C++ contains not just some but all features of C in combination with the object-oriented programming (OOP) technology. Being an upgraded quality tool, C++ new features such as data encapsulating were highly welcomed among C developers interested in the enhanced version of the familiar programming language. Other added features allow overloading functions, polymorphism, inheritance, and inline function calls. Unlike C, C++ uses “objects” defined by “classes”, program-code-templates that consist of data or code methods. Therefore, C technology that is not object-oriented is called a “procedural” programming language, while C++ was recognized as a hybrid language that contains both procedural and object-oriented capacities. Taking this into consideration, the next logical question will be: do you need to hire C++ developer instead of C specialist? Do You Need to Hire a C++ Programmer instead of C Coder? It is worth noting that both C and C++ are one of the most popular programming languages among developers all over the globe for many years in a row. C proved to still be highly effective and applicable, still, a lot of popular software is at least partly scripted in C++. C is a good base for further development, but nowadays many software developing companies require basic C++ knowledge as well. The paragraph below deals with proc of using C or C++ for your project and what differences you should note before choosing what expert programmer to hire. If you plan to develop a powerful software capable of a number of functions (desktop games, tasks managers, computationally intensive programs) and able to interact with a device’s hardware, both C and C++ can work for you. and also, C is not built for error or exception operating but C++ handles such additional options. can be applied for a numerous type of applications due to its powerful and fast-processing features. So, the right answer depends on the type and complexity of project you are planning to start or you have already been working on. Both C and C++ have their benefits, and you need to define your idea and purpose clearly to understand what language will work for you most. When it comes to C++, it has a huge range of usage, from GUI (Graphic User Interface) applications to 3D games materials. C++ is supported by many devices and platforms that make the language highly compatible with any user device and a great tool for cross-platform app development. Offering a huge library with standard functions and fast-processing operations, C++ proved to be convenient to use in application development. C++ web development is applied by a number of leading technology companies, including Apple, Google, Microsoft, Oracle, Amazon, etc. For instance, Adobe products such as Photoshop and Illustrator are built with the help of C++, the MySQL and MongoDB databases are partly written in C++ as well. Facebook uses C++ for app development and internal researches. Moreover, the famous operating systems Windows, Mac, and Linux are entirely or partly created with the use of C++. any applications of general purposes. Work on the core tasks and main problems first, then move on to the smaller tasks and details. Before the “scalable” C++ web development begins, you need to see if the concept features are fulfilled correctly. cout << "Please enter the operation to perform. Format: a+b | a-b | a*b | a/b"
It is important to take into consideration differences in average C programmer salary and corresponding C++ developer rates. It will be also interesting to compare average C++ developer salary in different countries with Ukrainian indicators of wages in order to make sure that it is not only good offer to hire such programmers in Ukraine from the financial point of view but also from the perspective of quality of work performed. We have made the following chart in order to show an average C and C++ engineer salary in 10 countries. This table shows that usually, C programmer salary is lower than C++ coder earns. However, in Canada, it is cheaper to hire a C++ programmer than C specialist. And among the studied countries, only Singapore offers the same rates to C and C++ developer. In general, the C programmer salary rate is one and a half times lower than C++ programmer rate. Thus, if you have decided to hire C developers, it will cost you less than working with C++ coders. After analyzing C++ developer cost in each country, it is possible to say that the highest rates get developers in the US. If we consider the wage of this programmer in Israel, it will be $8,000 a month. In the US, at the same time, an average entry-level C++ developer salary is $9,800. Let’s narrow the field for research and look at C++ developer salary NYC. Thus, if we talk about New York City, a C++ developer rate will be $12,800 a month, but the C++ game programming salary in NY state is $11,200. The next place in our list is occupied by experts from the UK. C++ jobs salary in the UK is estimated to be $4,000. The indicators of wages are almost equal in Australia and Germany and are the following: $5,000 and $4,900 accordingly. In Canada, an average C++ developer salary is $4,000. This indicator is comparable to the French one, where the rates of C++ programming jobs entry level is able to receive $3,500 a month. The level of salary of this coder in Singapore is approximately $3,000 per month. The average C++ programmer salary in Ukraine is $2,500 as a monthly payment. Summing up, we can see that Ukrainian programmers have the most reasonable level of the ratio of labor remuneration to the quality of work performed. In a row of countries where this indicator is quite high, this is explained by the same high living standards. Hiring a dedicated C++ engineer from Ukraine could be a great money saver, as comparing to other countries like UK and the US, employers may be paying to C++ coders up to 60% less in Ukraine. Both C and C++ developer salary rates are much lower than in the US or Western Europe, so hiring a remote Ukrainian specialist or Ukrainian team of programmers is cost-effective. We’ve made our research about C++ developer demand based on the data from Payscale and Dou resources. The salaries of developers usually correspond to the level of their knowledge and may differ in accordance with location. Let’s have a look at the salaries of junior, middle, and senior developers. Analyzing the above-mentioned info a bit, you can see that the average cost of a C++ developer in Ukraine is $1,800. Depending on the size of the company or project and the seniority of a developer – his cost may differ from $450 to $3,750. The C++ developer rate also depends on the city, where the developer is working. If you are wondering how C developer resume sample should look like, take a look at these prepared examples with skill sets and required experiences provided. Besides strong knowledge of what is C programming, proven working experience is a must. Technologies: C, Linux OS, Linux, SAN, Ethernet, IP, UDP, TCP, IoT, FPGA-programming. Technologies: C, Linux OS, Linux, IAR, POSIX, EEPROM, PWM, SPI, RTOS. Now, let’s find out what skills and technologies should be obligatorily included into C++ developer resume. Mobile game developer with more than 3 years of experience. Development of security products for mobile devices. Technologies: C, C++, Android SDK, GIT, GDB, Scons, Make, iOS, Debian build environment, etc. We decided to make one more mini-study and find out what is the C and C++ developers demand and supply in Ukraine based on the data available on domestic job boards. The results are as follows. The table below indicates how much active vacancies are posted on the most popular Ukrainian IT job resources. If we assume that the vacancies do not repeat, then on average we get 75 active offers. It’s also worth remembering that companies often look for C vs C++ developers at the same time, and such a query can give more results for an applicant when you look for C / C++ developer resume. Here is a graph that depicts supply for C and C++ coders in Ukraine. As we can see the number of developers’ profiles exceeds the number of vacancies approximately three times, so it is not hard to find a good C++ developer resume. This may mean that Ukrainian programmers are oriented at foreign markets and thus, their services are very often outsourced in Europe or the US, and foreign companies are eager to hire C developers and C++ coders. Let’s analyze two main and the most affordable possibilities of hiring a C++ developer to your project. These are project-based outsourcing and dedicated development team. Project-based outsourcing. This is the most optimal approach for companies interested in the implementation of single, irregular or pilot projects of different levels of complexity with clearly defined requirements and projected results. The advantage of this model is a fixed cost and a well-defined period of work performance. Consequently, the main risk is the situation not determined by the contract or possible delay due to unforeseen circumstances. But remote C++ developer can contribute greatly to your project at any stage of processing, so in case you are interested in an experienced specialist with a fresh point of view, hiring one programmer to work with your in-house team can work for you best. The risk of this method lies in some miscommunication with the devs, but the main advantages are the possibility to get any devs or extend your C++ app development team with rare professionals at any time, without the shortage of expenses for office premises, complex recruitment, and staff retention. Dedicated development team. If you have an upcoming project, but don’t know how to find a perfect C++ team of dedicated developers to implement your idea into life, you can use the service, which was made just to fit this need – outstaffing. This method is applicable to projects where it is impossible to calculate the timeframe for the work in advance. In this case, the client receives a C++ team of developers who work only on his project, the payment is usually calculated for each hour of a programmer’s work or may be also fixed all-inclusive and paid monthly. Speaking simple words – you come to the company, which provides staff, and leave your request for C++ development outsourcing. The company looks for employees to work on your project so that you don’t have to waste time on that. You don’t have to worry about the level of professionalism or devotion to your project. Developers offered to you will surely be interested in the whole thing and ready to solve hard tasks. You can learn more about building a dedicated development team on our website. If you are interested in more info about different types of programmers and their salaries, check out our big research on Ukrainian computer programmers for hire before you decide to hire C++ developer. Do You Have C / C++ Developers to Hire at Mobilunity? If you want the right developer to take a part in your project and want hire C developers or C++ programmers to work on your product, you will obviously consider several candidates on this post. Sometimes, it may be a bit difficult to choose a C / C++ developer, especially if all programmers are from different countries. If you happen to consider hiring C programmer to extend your team, Mobilunity can offer you great candidates for C web development and C++ projects as well. 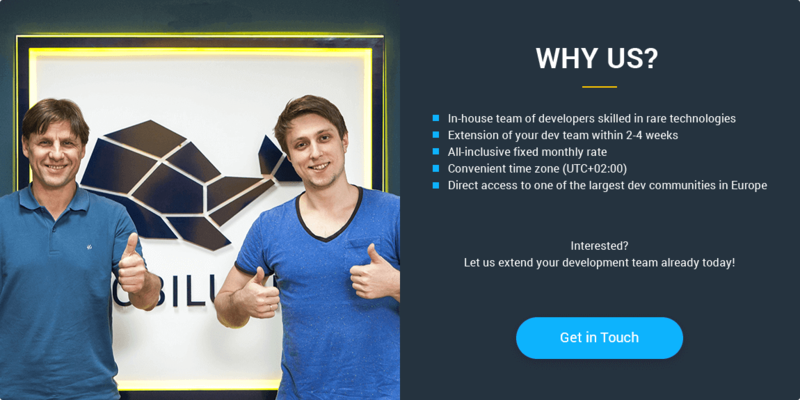 If you still have doubts, whether you should hire C programmer or C++ specialist from Ukraine, Mobilunity Team has already prepared the answer to the question ‘Why hire exactly Ukrainian developers?’. Need to hire the best C++ developers for your upcoming project? Let us find and outstaff the right candidates for you! What Is Ember Developer Salary in Europe and in the USA?